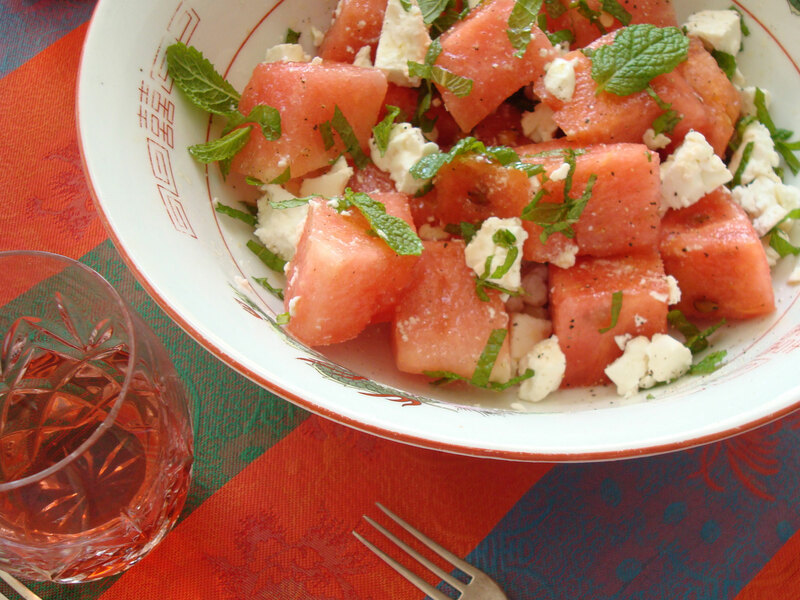 On a hot summer day nothing cools like Watermelon and after an afternoon gardening this simple salad with mint and feta brought succor to my parched tastebuds. The recipe is pretty loose, more of an idea really. Crisp, clean melon against salty cream of feta, aromatic mint, pretty and cooling in pink, white and green. I scoffed my bowl of salad, so be generous, the joy of this salad is the flavours and colours playing off against each other. Keep the salad chunky, so you can really taste the separate ingredients. And make sure you soak the feta, it makes all the difference. I kept my salad simple, but you can add other ingredients. My brother Matt suggests adding toasted pumpkin seeds, while Nigella makes a more complex salad with black olives and red onion, using lime juice in her dressing. The dressing will give you enough for a large salad, so you only need a bit per serving. I tried the salad with Danish cow’s milk feta, the super-smooth white one but it was better with traditional Goat’s milk feta, the crumbly one in the photos. I really recommend taking the time to soak your feta in milk, it makes all the difference. 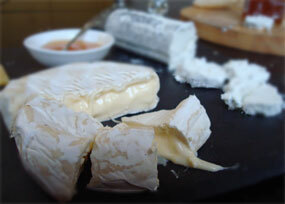 More on about the difference between Danish and Greek feta. 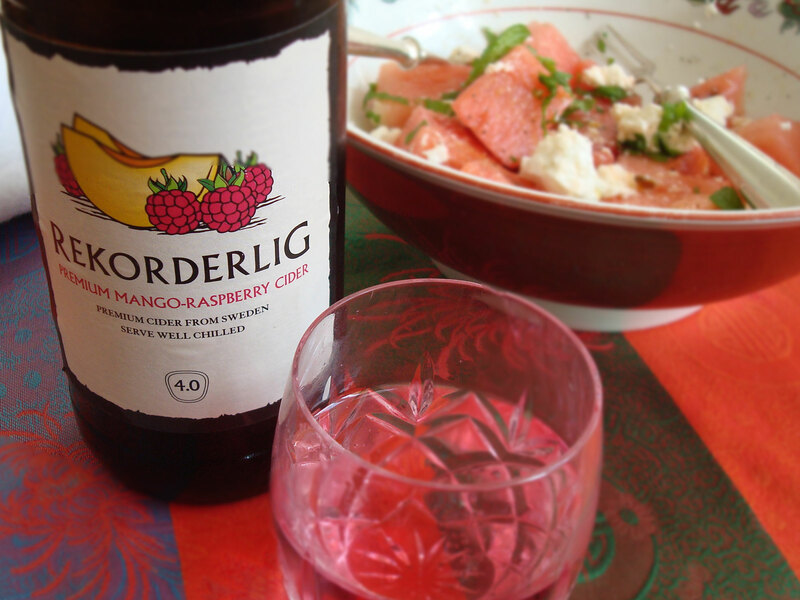 Rekorderlig Premium Mango-Raspberry Cider pairs beautifully with this salad. I paired my simple version with a Rekorderlig Premium Mango-Raspberry Cider. It’s pink deliciousness perfect with this fragrant salad. 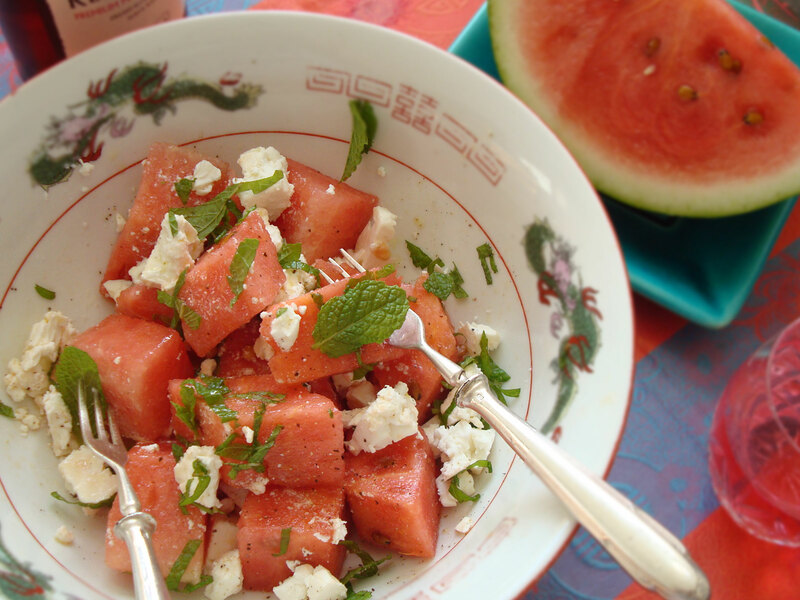 Just before you’re ready to serve, combine mint and watermelon in a bowl, crumble the feta roughly, not too finely and gently sprinkle on the dressing. Add those pretty mint sprigs. Pour a cool drink and serve. This is a great addition to a summery barbeque, a small plates spread or lunch but I had mine on it’s own after my day in the garden. It’s a great restorative. Oh and by the way eat it up, this salad won’t last, much like the fleeting days of summer. I make Peter Gordon’s watermelon and feta salad, which includes pumpkin seeds toasted in olive oil, black pepper and lemon juice. Its a favourite of mine, but over the years has certainly polarised friends. Many refuse to even try it. My goodness how could anyone not try it? It’s such a pretty dish. I tried a watermelon and queso salad recently and it was a game changer. I find some fetas can be a bit too sharp for my tastes, but queso is smooth and creamy. Ooh I have never tried queso, but I know what you mean about feta being sharp. I always soak my feta now- it takes away that really harsh salty brine flavour and lets the creamy lactic tastes emerge. Yum. Where did you try queso? It was in the watermelon salad at Maldito Mendez at Ponsonby Central. Special stuff. ONe day I hope I can make some myself!